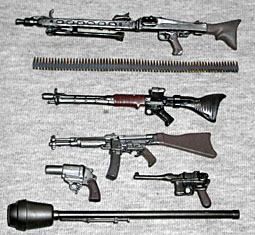 My, grandma, what big guns you have! In an alternate reality, Japan lost World War II not to the Allied Forces, but to Nazi Germany. Now dissident sects are taking on the government, and it's up to the Capital Police's Panzer division to keep the peace. Considered to be the last great anime film of the 20th century (or the first great one of the 21st century), Jin-Roh: The Wolf Brigade is a mixture of political intrigue, love, moral questioning and a fair bit of action. The story focuses on Fuse (that's two syllables, Few-Say, not the thing that makes electricity work), a Panzer cop who hesitates just long enough for a terrorist to detonate the bomb she was carrying. Put on suspension and sent for retraining, Fuse falls in with the girl's older sister, and starts to question the way things are. It's really a quite good film. 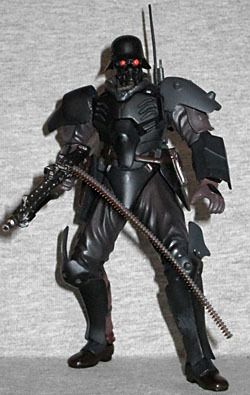 The Panzer armour is totally toyetic; based on WWII German stormtrooper gear (in much the same way that Gundam's Zaku II was), there are stylish metal plates on chest and hip, pauldrons (one spiked), shin guards that flare out at the knee, a helmet and gas mask combo (with eerie red glowing eyes), and a technological backpack. There's a second spiked pauldron with light blue stripes, so you can re-enact the training session seen in the film. You can remove the hip and shoulder pieces and the backpack, stripping away a lot of the bulky suit. 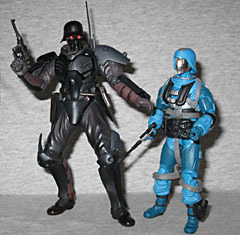 An interchangeable, unmasked head is included with the set, as is a second right hand with extended trigger finger. 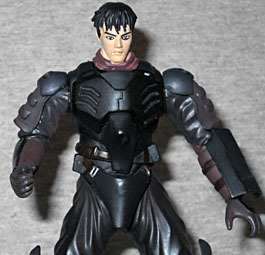 It's astounding how very different the figure looks when all the pieces are removed and he's in his "human" guise than when he suits up and becomes the wolf. Sure, the legs are the same, but they otherwise might as well be two different toys. 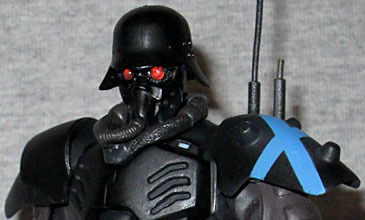 Jin-Roh is a soldier, and comes with an appropriate (and historically-accurate; none of the weapons were made after 1945) arsenal to back him up. The biggest and baddest, the one the Panzers utilize most often in the film, is the MG-42 machine gun; it also has a string of bullets that can be attached. Next there's an FG-42 assault rifle, a precursor to modern assault rifles that was produced in extremely limited quantities (it had too much recoil). Called a "stun-gun" on the packaging, the Sturmgewehr MP-44 was used in the training scene to fire rubber bullets; in real life, it was copied by the Russians to become an AK-47. The "Campf Pistole" is a Walther flare-launcher, intended to do just that (but modified by the Germans to fire grenades). There's a Mauser C-96 - perhaps best known for being converted into Han Solo's blaster - and a Panzerfaust 30, the unreliable single-use rocket launcher. That tiny tiny toys can be so readily recognized should tell you something about the attention to detail that went into this set. I should mention one thing that really surprised me about this figure - how small he looks! Having seen pictures of the figure, I expected a 6 or 7" scale. Actually, he's only about 4¾", making the detail of the sculpt all the more impressive. He towers over GI Joe, but is dwarfed by just about everything else. He's articulated at the shoulders, elbows, wrists, waist, hips, knees, and ankles. Contains small parts small child might cause suffocation." Take care of sharp edge not to harm your eyes. Rhe plastic package might harm you so becareful whe opening.